"Great gluten-free option for a day of grilling." Toast sesame seeds in a small skillet over medium heat until lightly browned, 3 to 5 minutes. Combine sesame seeds, soy sauce, sugar, green onions, sesame oil, garlic, and red pepper flakes in a saucepan. Simmer over medium-low heat, stirring constantly, until flavors combine, about 10 minutes. Remove from heat and let marinade cool completely, about 15 minutes. Place short ribs in large resealable plastic bags and cover with cooled marinade. Seal and let marinate in the refrigerator, at least 1 hour or overnight for maximum flavor. Drain short ribs, discarding marinade, and cook on the preheated grill until browned, about 5 minutes per side. 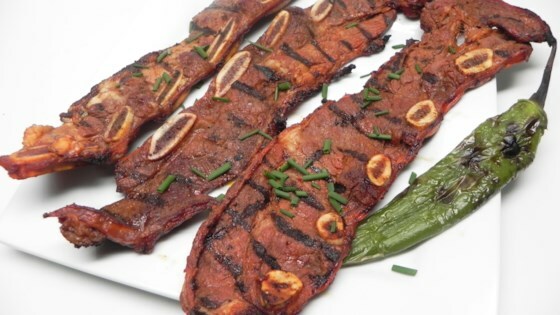 See how to make Korean-style grilled short ribs. Set aside a portion of the cooled marinade in step 2 if you want a dip for your grilled ribs.